Apple will begin selling the coveted iPhone 5 in Israel on December 14, as part of a worldwide launch in 50 countries. 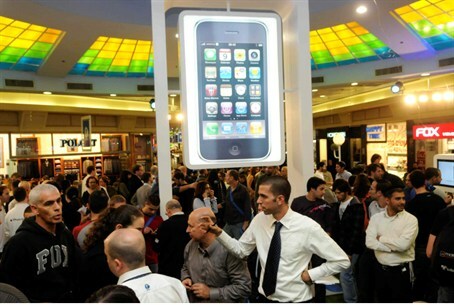 Apple has announced that it will begin selling the coveted iPhone 5 in Israel on Friday December 14, which falls out during Hanukkah, as part of a worldwide launch in 50 countries, the Israeli business daily Globes reported. The iPhone 5, which is already on sale in 47 countries, will be made available through Israel's major mobile carriers. It is currently available for purchase in private stores for the hefty fee of about NIS 7,000, approximately $1,800. According to reports, one of the greatest improvements of the iPhone 5 is that it retains its excellent quality and Retina display technology but has been enlarged to 4 inches from 3.5 inches and has five rows of icons instead of the previous four. Despite the screen enlargement, however, it is thinner than its predecessor. It also has more advanced photography capabilities as well as an array of other notable advancements. The iPhone 5 weighs 112 grams and is 7.6 millimeters thick, while the iPhone 4 weighs 140 grams and has a thickness of 9.3 millimeters. Despite international allegations of a so-called “humanitarian crisis” in Gaza, the pricey new smartphones have already been available in the Hamas-ruled enclave for months, where they continue to sell like hotcakes.